Carrots are the second most popular vegetable after potatoes. They provide huge amounts of vitamin A and fibre as well as other vitamins and minerals. Carrots come in different colours. In the16th century, Dutch carrot growers invented the orange carrot in honour of the House of Orange, the Dutch Royal Family. They cross- bred pale yellow carrots with red carrots. Newly orange, carrots traveled to England with Dutch travelers during the reign of Queen Elizabeth I.
Bugs Bunny loved them and so should you. Eating carrots will encourage healthy skin, hair, bones, eyesight and will also cleanse the body. 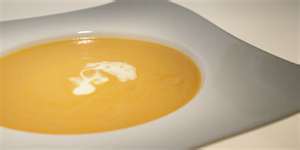 Carrots are wonderful vegetables, how about making a nice cream of carrot soup of them? Soup is among the earliest cookery achievements of humans. Thank goodness. I hope you will try this cream of carrot soup to see if you carrot all for it. Oh Anthony, carrot soup. I love your recipes because I always agree with all your ingredients, too. Always nutritious. I knew carrots had been bred to be orange, but I'd never known why. A delicious recipe and a history lesson? Doubly fantastic. SUSAN ROEBUCK: Your mama was right (of course) but you would really have to load up on carrots before you would turn orange. Please try this version, I believe you will truly enjoy it. MANZANITA: Hi,You say such nice gracious things, Thank You so much. TORVIEWTORONTO: Thank You,we love this soup, and always have carrots in the icebox. I've never thought to make carrot soup. That's a cool idea. And it's neat to learn about how carrots used to be all different colors! Thanks for posting. I love Cream Of Carrot Soup... minus the wine but just because it is not in my diet. I brought some fresh nutmeg back with me the last time we went to the Carribean and this would be great to use it on. Try using cardamom instead of nutmeg. You'll find, I think, that the result is a bit more uplifting or Springy because cardamom has citrus overtones. Just an idea. You would have to destroy the capsules they reside in and mash them to free the flavors. NATE WILSON: Thank You for your kind words. JESSICA L FOSTER: I love carrots a lot. I've been known to grate some into kasha varnishkes even. MY JOURNEY WITH CANDIDA: I have a lot of nutmeg in my cupboard. It is a 16 oz container and I probably have 15 oz remaining. I would love to visit the Caribbean, the water is so clear there. I love carrots, but am unsure how to make them cream. Maybe show them naked pictures of other ground tubers? Ewww, I just skeeved MYSELF out. Oh yummy! I love carrots and just never thought of soup. Will have to try for sure. Thanks for the recipe. Anthony! Another soup! You're the best! I am making this later in the week. I have everything except the heavy cream. I'm buying it tomorrow. What a perfect first starter for EASTER especially for the Bunny :) the kids would love this one! I eat carrots at my bay, but have never tried them in soup. Looks really good. You are doing so well on this a to z! Hi Anthony, keep up the good work with your A-Z! Ha! I didn't know the history of carrot colours. Fascinating! LADY DRAGONFLY: You will love this soup. Thanks for visiting. SUSAN OLOIER: Thanks for your compliment. I wonder if Zane would like it; please tell him we wish him the best. PEGASUSLEGEND: You're right, thanks. I can't wait to try your coconut spiced chicken recipe. PAT HATT: When I worked in an office I sometimes took raw carrots and celery to nosh on. KALYANI: Thank You, it is that. JOANNE: I appreciate your sweet compliment, Thank You. KAVERI VENKATESH: A little goes a long way.Thanks for visiting. DUNCAN D HORNE: Thank You Duncan, your A-Z alphabetical sentences are terrific. LYNN PROCTOR: Yes it is a lovely soup. Thanks for calling. LYNDA R YOUNG: Your wedding picture is beautiful, glad you liked the carrot info. Hi, love your theme and will have to try some of your recipes, my C was also about soup, take care. KANAN PATEL: Please do, and Thanks for visiting. RCH: Thanks for the compliment. White wine added, yet another delish...am going totally soupy! THE JUNKIE BOOK: This is a soup to thrill your taste buds. Thanks for calling.